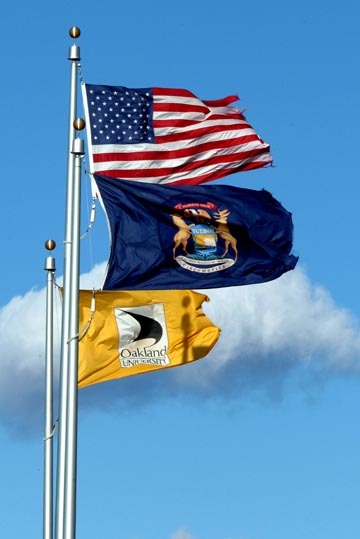 As the nation prepares to vote this November, Oakland University’s Office of Government Relations seeks to inform and engage students, faculty, staff, alumni and the community at-large with local issues and candidates. The office will host a Meet the Candidates Open House from 5-7 p.m. on Tuesday, Oct. 23, at the Shotwell-Gustafson Pavilion on Oakland’s campus. Invited candidates include those running for Oakland countywide seats, and those running for State House and the United States House of Representatives in the top cities of residence for OU students, faculty, staff, and alumni. Michigan Congressional District 11 includes cities and townships in Oakland and Macomb counties, and Michigan Congressional District 8 includes of all of Clinton, Ingham, and Livingston counties, as well as the southern portion of Shiawassee and the northern portion of Oakland counties. The Candidate Meet and Greet is free and open to the public. Light refreshments will be served. To attend, RSVP to dimercur@oakland.edu or call (248) 370-3683 by Friday, Oct. 19. Interactive and printable campus maps can be found at oakland.edu/map. For more information about the event, view the flyer. Summary OU will host a Meet the Candidates Open House from 5-7 p.m. on Tuesday, Oct. 23, at the Shotwell-Gustafson Pavilion on Oakland’s campus.